Roy Groves is the Operations Director of a successful company manufacturing dashboard instruments for luxury cars. A fatal motorway fire is traced back to a fault in the product supplied by Roy’s company. Was it a tragic accident or something more sinister? As Roy and his colleagues battle to establish the cause of the fire, and save the company from bankruptcy, they discover that they have been the victims of sabotage. Eventually it emerges that an old enemy of Roy and the rest of the team has reappeared and is intent on destroying the company and every member of its management team. 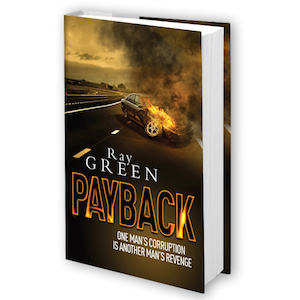 Once just a business adversary, their nemesis is now so consumed with hatred that he is on the edge of insanity, and resorts to blackmail and even murder in the pursuit of his goal.Payback is a chilling tale of how hatred can twist and corrupt the human soul.